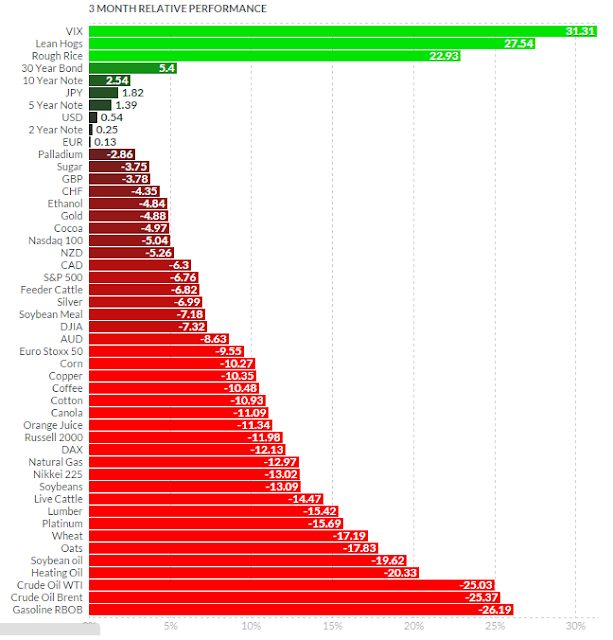 Unless you were hiding out in rough rice or lean hogs, commodities were not your friend in the third quarter of 2015. GoldCore compiled three-month relative performance of commodities with data from Finviz.com. Worries out of Asia hurt commodities. China is rebalancing, emphasising consumption over investment. It's stock market gyrations also dragged down metals. The Shanghai Composite Index falling from the peak of 5,166 in mid-June to 3,038 at the end of September. Having pointed out the 'surges' in the cost of your 4th of July burger at the behest of Greenspan and Bernanke, we thought a reflection on the soaring costs of 'the most important meal of the day' were in order. 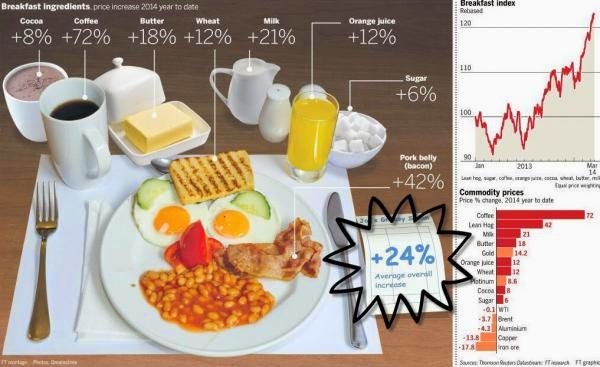 As the following chart illustrates in words and pictures even a PhD Fed economist or CNBC pretend-economist could understand - food-inflation is here from breakfast through dinner (no matter how many iPads we try and eat). Conditions favourable for monsoon to advance into M.P., U.P. The low-pressure area over West Bengal has started interacting with the western disturbance to bring monsoon rains over the hills in North-West India and parts of adjoining plains. The India Met Department said that rain has occurred at most places over Himachal Pradesh and Uttarakhand in North-West India and Bihar, Jharkhand, West Bengal and Sikkim in East India. But the northern limit of monsoon failed to make further progress after it broke the 15-day jinx to get a peep into parts of the North-West. Conditions are favourable for its advance into some more parts of Madhya Pradesh, remaining parts of Uttar Pradesh, Haryana (including Delhi), Punjab and some parts of north Rajasthan during the next two days. Many places over Jammu and Kashmir, east Uttar Pradesh, Assam, Meghalaya, Odisha, Konkan, Goa, and coastal Karnataka received heavy overnight rainfall on Wednesday. But the rain was confined to few places over west Uttar Pradesh, Nagaland, Manipur, Mizoram, Tripura, Tamil Nadu and Lakshadweep. Isolated places over Haryana, Delhi, east Madhya Pradesh, Gujarat, coastal Andhra Pradesh and north interior Karnataka witnessed passing showers. Global models suggested that the ‘low’ over East India may continue to be active until the weekend before weakening over Odisha. This is also the time around when the ground will have been prepared for the initiation of a cyclone/typhoon in the north-west Pacific, east of the Philippines. These models hinted that a preparatory low-pressure area may take shape by the weekend. It would go on to become a strong typhoon in the East China Sea. The system would concurrently become the prominent feature in the entire Asian monsoon system and would start pulling in flows from the Arabian Sea. These flows would be dragged into place over the West Coast first, before residual flows are hauled over peninsula, south Bay of Bengal, and onward into South China Sea/north-west Pacific. Heavy to very heavy rain is likely over the West Coast right from Konkan-Mumbai down to north Kerala during the next week, according to a US Climate Prediction Centre. Just when you thought it was safe to leave your shelter and buy a car, buy a home, buy some Caterpillar trucks, and buy a Starbucks; NOAA reports the globe just experienced the hottest May on record...With El Nino looming, we can only imagine the excuses of 'extreme weather' that will rear its ugly head once again in Q2 earnings... though of course all this will be fixed in Q3? More than three year ago, Narendra Modi, chairing a working committee to suggest steps for reducing gap between the farmgate and retail prices and recommending an action plan for better implementation and amendment to Essential Commodity Act (ECA) had submitted a report. This report is insightful, constructive and radical in its approach. The highlights are: speedy reform of APMC Act across the country and liberalisation of agri-markets; explore unbundling of FCI operation in terms of procurement, storage and distribution functions; to set up a ministerial level coordination mechanism at the national and the regional level for coordinated policy making for evolving single national agriculture market; recommended that offences under Section 10-A under the Essential Commodities Act should be made non-bailable and special courts should be set up for speedy trial of offences under the ECA. The report had touched on the issue of information asymmetry both on the demand as well as on the supply side. It had pointed that if the collation and capturing of data is supplemented with the flow of information then it would fundamentally change the face of market. If necessary, it could done by creating a dedicated agency for the purpose. The report further said: “Since food security being the utmost concern, for the time being there should be a ban on the trading of essential commodities in the futures market” ( Point 2.7, Page 8). The report also mentions about the “market failure” and traders making excessive profits. However, no evidence or empirical data has been provided to substantiate the point. The report talks about the creation of agri-infrastructure and, in its recommendation, has laid emphasis on post harvest linkages. It talks about the Government providing financial assistance for construction of godowns at village levels along with godowns at PACS (Primary Agricultural Co-operatives Societies). While it is appreciated that the recommendation has looked at “small is workable,” it has may have erred in recommendation of PACs in the role which does not have any specialised functional expertise. This report is a document which gives 20 recommendations with 64 detailed actionable points that will facilitate expeditious implementation. The report has largely been ignored till now, however, the committee needs to be complimented for taking the bull by its horns and addressing the issue which will have significant impact during the tenure of the current government. Exports of marine products touched a record $5.007 billion during 2013-14. At a news conferenceLeena Nair, chairperson of the Marine Products Export Development Authority (MPEDA), said the total export earnings were $5.007 billion (₹30,213 crore.) In rupee terms, the growth was a whopping 60 per cent over the previous year, though in dollar terms this was 42.60 per cent. In the previous year, the earnings were $3,512 million. In quantity terms, 9,83,756 tonnes were exported, an increase of around 6 per cent. Fish items were the largest chunk in terms of quantity, though when it came to value, frozen shrimp was the biggest money earner. More than three lakh tonnes of shrimp were exported, of which 73 per cent was cultured. There was also a 35 per cent increase in unit value – black tiger shrimp secured the highest value. Among regions, South-East Asia continued to be the largest buyer of Indian marine products with a share of 26.38 per cent, followed by the US with a share of 25.68 per cent. The European Union is the third largest buyer with 20.24 per cent share, followed by Japan at 8.21 per cent, other countries 8.20 per cent, China 5.85 per cent and West Asia 5.45 per cent. 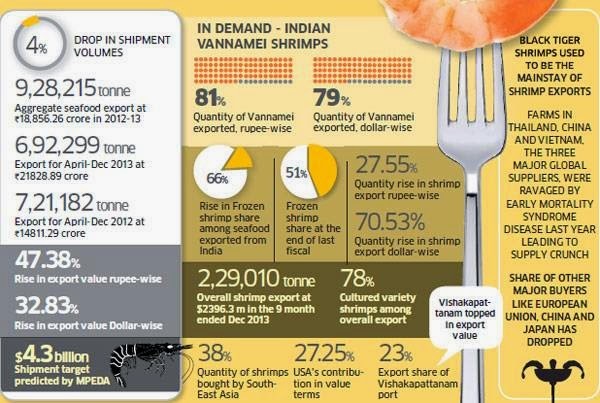 One reason for the higher exports is increased production of L. Vannamei shrimp, whose exports to the US market jumped to 59.63 per cent. Export of frozen shrimp rose by 7.38 per cent in quantity terms and 28.23 per cent in dollar terms. Nair said lower exports from Thailand and other prawn-producing countries because of a disease that had afflicted their aquaculture. On the other hand, depreciation of the rupee against the dollar and increased production of vannamei in Andhra Pradesh and other States helped in higher earnings from prawns. The quality of Indian prawns and other marine products had improved remarkably – contributing significantl to the rise in unit price. Participation in major global seafood fairs also had helped. Raising the pitch against import ban on mangoes placed by the EU, Commerce and Industry Minister Anand Sharma has said that the bloc should not “precipitate’’ a situation that requires India to take the matter to the World Trade Organisation. “We do hope that the EU will see sense, considering the strengths of the economic partnership between the two, and not precipitate a situation which needs us to go to the WTO. We hope the issue will be resolved bilaterally between India and the EU,” Sharma said addressing a press conference on Friday. The EU banned import of mangoes, bitter gourd, taro, egg plant and snake gourd from May 1 following detection of insects in some consignments. India says that the ban is unfair as it has now put in place stringent packaging and inspection norms to ensure that such incidents do not recur. India has made it mandatory for exports of all perishable items to the EU to be routed through pack-houses certified by the Agriculture and Processed Food Products Export Development Authority (APEDA) under the vigilance of plant protection inspectors. “We have, through APEDA, invested in creating world class laboratories and their certification processes are accepted by the EU, the US and other countries. “That is why the APEDA, with the Commerce Ministry, has taken up the matter with the EU,” Sharma said. The Minister added that India’s Ambassador to the EU in Brussels has been given clear instructions and the mandate of what to convey to the 27-member bloc. “Let us wait for a response,” he added. Although only about 5 per cent of India’s total exports of perishables to the EU estimated at €400 million have been affected by the ban, Sharma said that such ban hurts resource-poor farmers. Sharma has already written to EU Trade Commissioner Karel De Gucht against the ban and demanded that it be lifted soon. Spices from India are going places, with exports on course to top $3 billion by 2016-17. Led by creative marketing strategies to ensure high brand recall, spice majors are competing with their domestic counterparts through continuous innovations in packaging, strength in quality and a strong distribution network. Several local companies have also made their presence felt in the international market, by following a dual branding strategy to cater to the Indian diaspora in the global market. Indian brands bought out by international spice majors, such as MTR, have also been straddling both strata. Incidentally, Oman is a larges buyer of Puliogare powder, followed by the UAE and South Africa. South Africa turned out to be the largest buyer of puliogare powder during April, with Bangalore accounting for 50.1 per cent of exports, according to available shipment data. Within the country, the company has been competing with big time players such as MDH, Badshah and Eastern Masala, and has also gone in for diversification. 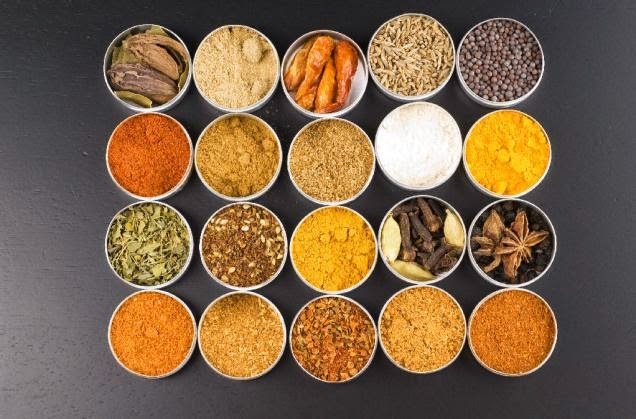 The Indian spices market is pegged at ₹40,000 crore annually, of which the branded segment makes up 15 per cent. According to Technopak, the branded space is dominated by national brands such as Catch, Everest, Ramdev, among others. “All these brands have focused on product packaging, product customisation to local taste and positioning around quality. 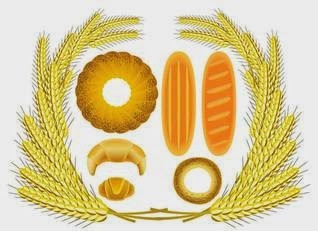 They have also ensured innovative marketing strategies for high brand recall,” said Reetesh Shukla, Associate Director, Food Services, Technopak. Increasing urbanisation paired with a rise in number of working women has reduced the time of cooking. Consequently, home-makers have started demanding readymade spice mixes such as sabzi masala, garam masala, chicken masala etc. This has augmented industry revenues, officials said, as both spice mixes and branded spices entail greater profit margins, as compared to straight and unbranded spices. An El Nino will probably start as soon as July, according to the Australian government forecaster, adding to predictions for the event that can transform weather around the world and roil commodity prices. All the climate models surveyed indicated that an El Nino was likely this year, with six of seven models suggesting that thresholds for the event may be exceeded as early as July, the Bureau of Meteorology said in a statement today. A warming of the Pacific Ocean, which drives the changes by affecting the atmosphere above it, will probably continue in the coming months, the Melbourne-based bureau said. El Ninos can bake Asia, while bringing wetter-than-usual weather to parts of South America and the U.S., challenging farmers from Indonesia to Brazil with too little rain or too much. Palm oil and sugar were listed by Goldman Sachs Group Inc. this month as among crops that may be affected if an El Nino sets in. The World Meteorological Organization warned last week of a dramatic rise in world temperatures should an El Nino reinforce human-induced warming from greenhouse gases. The last El Nino to form was in 2009 to 2010, and since then the Pacific has either been in its cooler state, called La Nina, or neutral. Disruptions associated with El Ninos have been most important for agriculture markets, with palm oil, cocoa, coffee and sugar most affected, Goldman analysts including Jeffrey Currie wrote in an April 13 report. 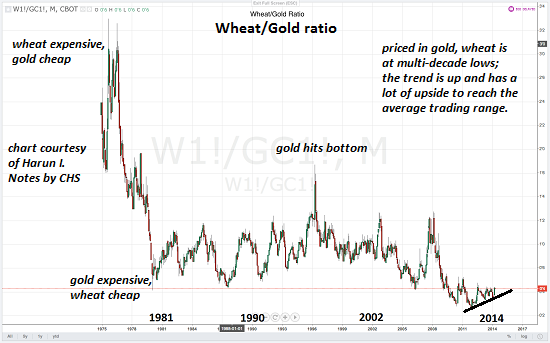 An El Nino would boost risks to soft-commodity price forecasts, they wrote. The chances of an El Nino have increased to 65 percent from 52 percent, the U.S. Climate Prediction Center said on April 10. There are signs that an El Nino is imminent, presaging changes to global weather patterns, the United Nations’ World Meteorological Organization said April 15. Two weeks ago, the Australian bureau put the odds at more than 70 percent. Soybeans Rise to 10-Month High After Record Crush in U.S.
Soybeans extended their climb to the highest level in more than 10 months after a report showed record demand from U.S. mills, boosting concern that supplies from the world’s second-biggest exporter would be reduced. Soybeans for July delivery rose as much as 0.8 percent to $15.2025 a bushel on the Chicago Board of Trade, the highest price for a most-active contract since June 6. Futures were at $15.155 by 6:53 a.m. local time, rising for a fourth day and taking this year’s increase to 17 percent. Processors crushed 153.84 million bushels in March, up 12 percent from a year earlier and the most for the month since at least 1998, the National Oilseed Processors Association reported April 15. Domestic stockpiles at the end of August will be 135 million bushels, less than the 145 million bushels forecast in March and below 141 million last year, the U.S. Department of Agriculture said last week. 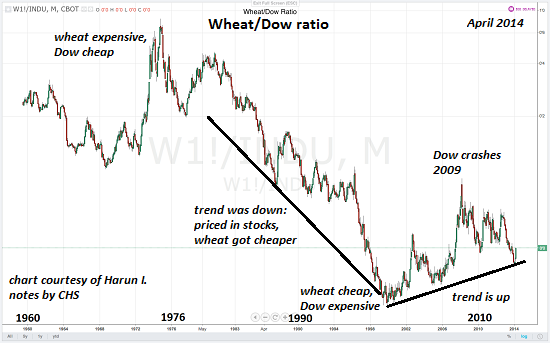 Soybean prices are “supported by worsening tightness in U.S. soybean supplies,” Luke Mathews, a commodity Strategist at Commonwealth Bank of Australia, wrote in a note today. Slightly better-than-expected Chinese economic data has also supported “improved sentiment within the oilseed market and helped traders turn a blind eye to recent reports of Chinese soybean cancellations” and defaults, he said. Importers in China, the biggest buyer, may default on as much as 2 million metric tons of shipments, according to the U.S. Soybean Export Council’s Beijing office. The country’s gross domestic product rose 7.4 percent in the first quarter, government data showed yesterday. The median estimate of analysts in a Bloomberg survey was 7.3 percent. 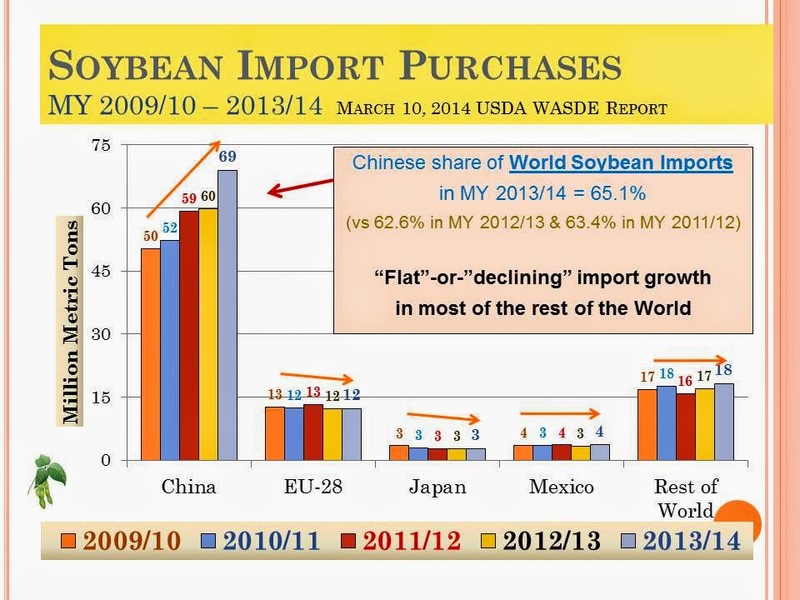 Image Source :- KSUGRAIN Very Informative do Visit. Palm oil to test supports, rise. Malaysian palm oil futures on the Bursa Malaysia Derivatives were higher on Monday buoyed by strength in the energy complex, firm soya oil markets and a slightly weaker local currency. 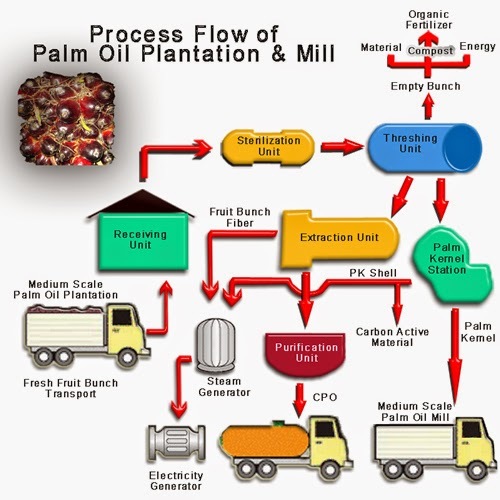 Higher energy prices could result in higher bio-diesel demand for palm oil. WTI crude oil rose above $104 a barrel in early trade on Monday as increasing geopolitical tensions between Ukraine and Russia supported buying sentiment. 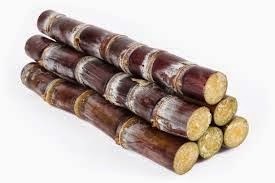 Market participants are also watching for cargo surveyor export data for the first half of April, due on Tuesday, to gauge global demand for palm. CPO active month June futures are moving on expected lines. As mentioned in the previous update, though prices have bounced from Malaysian ringgit 2,610/tonne, break below MYR 2,595 could drag prices towards 2,550-65 levels, from where a possible intermediate bottom can be seen. However, since prices have closed on weaker note, it could consolidate in the 2,595-2,650 range. A decisive break above MYR 2,672 could hint at strength again which could potentially push prices towards MYR 2,730-35 levels being a strong resistance level in the coming sessions. Favoured view: Expect prices to edge higher either after testing the above mentioned supports or directly moving above MYR 2,660/tonne levels. Only a direct fall below 2,573 could dash our bullish hopes. As mentioned earlier, prices met an intermediate wave target at MYR 2,135 and corrective decline to MYR 2,345-50 levels, followed by a sharp third wave move to MYR 2,575-2,600 materialised. Price structures suggest a possible third wave move ending at MYR 2,690 and a corrective, fourth wave with targets at MYR 2,450 or even lower. The fifth wave possibly ended at MYR 2,898 and a corrective A-B-C in progress with an equality target at MYR 2,615-20 levels and an extension even to MYR 2,545-50 . RSI is in the neutral zone now indicating that it is neither overbought nor oversold. The averages in MACD have gone below the zero line of the indicator hinting at a bearish reversal. Only a crossover again above the zero line could at resumption in the bullish trend. Edible oils ruled firm on Monday, tracking firm Malaysian palm oil futures which extended gain for second consecutive day. Local refineries increased their rates for palmolein and soya oil by ₹3 for 10 kg on the back of higher demand. Sources said that local stockists came forward with fresh orders for forward purchase. Liberty, Ruchi and Allana together have sold about 750-800 tonnes of palmolein at ₹603-605 and 100-150 tonnes sunflower refined oil at ₹662. Resellers offloaded 150-200 tonnes palmolein at ₹600-601. Indigenous edible oils were also showing slight current on renewed demand from brands. Vikram Global Commodities (P) Ltd quoted ₹630/10 kg for Malaysia super palmolein. Liberty was quoting palmolein at ₹608, super palmolein ₹628 and soyabean refined oil ₹655. 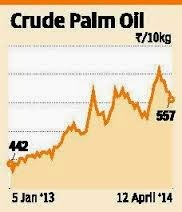 Ruchi quoted palmolein at ₹605, soyabean refined oil ₹655 and sunflower refined oil ₹665. Allana was quoting palmolein at ₹604-605, soyabean refined oil ₹656 and sunflower refined oil ₹665. At Rajkot, groundnut oil telia tin was flat at ₹1,110 and loose (10 kg) at ₹700. In Mumbai nominal spot rates (₹/10 kg) were: groundnut oil 735 (730), soya refined oil 655 (652), sunflower exp. ref. 610 (605), sunflower ref. 670 (665), rapeseed ref. oil 675 (672), rapeseed expeller ref. 645 (642) cottonseed ref. oil 658 (655) and palmolein 601 (598). El Nino, which may affect India’s South-West Monsoon and result in drought, could derail the bull party in the equities market, analysts and brokers fear. This week, the Austrlian Bureau of Meteorology said there was more than 70 per cent chance of the El Nino occurring, while the US Climate Prediction Center said there is 50 per cent chance of the phenomenon, resulting from rise in the sea surface temperature in the Pacific Ocean, setting in later this year. Next week, the India Meteorological Department will come out with its projections of this year’s monsoon and chances of El Nino setting in. Global investment banker and institutional securities firm Jefferies said El Nino is one of the extremely few extraneous events that could cause the new Government to change the focus away from investment-inducing, pro-economic growth policies. “Overall, we are not too concerned about El Nino currently despite rising risks. “While the situation should be monitored, there is no reason to reduce our positive bias on the market both ahead of and after the election, at least for the next three months,” it said. In the worst case, the weather could become a substantial factor around the Budget time in mid-July, Jefferies said. According to Bank of America-Merrill Lynch, the real test for the investors will be impact of the three big ifs facing the country — the polls, the El Nino and the dollar. BNP Paribas said El Nino-driven rainfall deficiency could enhance profitability of plantation companies but depress margins of home and personal care consumer companies. Singapore-based brokerage DBS on Friday said inflation in India may jump to over 8.5 per cent and GDP growth may slip to 5 per cent in the current fiscal if the much-feared El Nino threat plays out this year. Dipen Shah of Kotak Securities said: “We continue to maintain that, in the short term, markets will continue to be volatile at current levels with a positive bias. Focus will shift to growth, interest rates and valuations once the political event is out of the way. El Nino is likely to set in only after July, but there have been occasions when India had gone unaffected by the weather phenomenon. Already, Australia and parts of South-East Asia are reeling under hot weather and prolonged dry period. On the other hand, central and north-western parts of India have received rains and hailstorm during February-March, resulting in better water storage level. Currently, the level in the 85 major reservoirs is more than the average seen in the last 10 years.